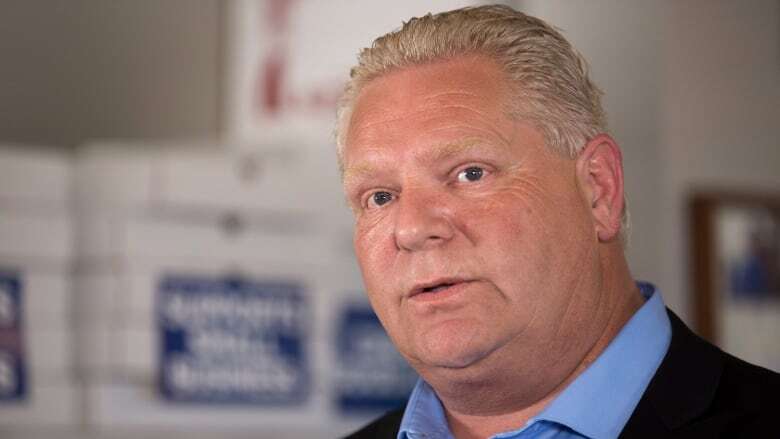 Progressive Conservative Leader Doug Ford faced tough questions on Thursday as controversy dogs the abrupt resignation of the party's candidate in Brampton East. Simmer Sandhu quit his post Wednesday evening as it was revealed that his one-time employer, 407 ETR, is probing the "inside theft of data" that affected some 60,000 customers. While the company did not specify who is under investigation, Sandhu released a statement saying he had recently been made aware of allegations made against him. He called them "totally baseless" and said he's confident his name will be cleared. On Thursday afternoon, the New Democratic Party called on Ontario's chief electoral officer to launch an investigation into the "alleged misuse of personal data from 407 ETR. "We are profoundly troubled by these allegations," said the NDP's provincial secretary, Karla Webber-Gallagher, in a statement. "As there are fewer than 21 days left in the Ontario election and as advanced voting begins next week, time is of the essence." The NDP included 10 questions the party would want to see answered by such an investigation, the first being, "Does the PC Party of Ontario, its campaigns or its candidates, have in their possession or access information from the 407 ETR?" While campaigning in Cambridge, reporters pressed Ford to clarify what the PCs may have known about the existence of the data. The Tory leader said he "found out about this yesterday" and said little to expand on a previous statement circulated by his campaign spokesperson. "I immediately made the decision," Ford said of his choice to part ways with the candidate. "Our party is looking into this ... I took immediate action as soon as I found out and we are moving forward with a new candidate." When asked how he might respond if the scandal envelops other candidates, Ford said simply, "We won't tolerate it." He said any further questions about the data breach should be directed at Sandhu himself. Ford was also plagued by questions about his attendance at an April 29 fundraiser in Scarborough, a breach of Ontario election finance law. Ford said he attends hundreds of events and that he was "very clearly misled" about the purpose of the fundraiser by its organizer, who has since been fired from the PC campaign team. At a campaign event in Kingston, Liberal Leader Kathleen Wynne called both controversies "very disturbing" and said Ford should provide a "full public accounting" once the PCs have had time to investigate what went on. "Doug Ford is aspiring to lead the province and I think there's only one course, and that is complete transparency and honesty. I think he needs to bring in the police and I think he needs to share everything that is known," she told reporters.